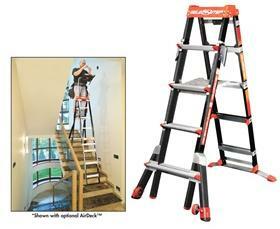 The Little Giant Ladder&reg;Cage adjustable enclosed platform is a versatile, safe alternative to tying off. The cage is constructed of non-conductive, high-strength black-resin fiberglass. The Cage is fully adjustable, allowing the operator to adjust the platform height to the job at hand. Each side adjusts independently, so operators can also use the Cage over uneven surfaces or stairs, where a mechanical lift or ordinary stepladder could never go. The Cage protects operators in a fully enclosed working platform, allowing them to work safely and quickly with two hands while complying with OSHA standards. With time and energy-saving Tip &amp; Glide&#153;<?xml:namespace prefix = o ns = "urn:schemas-microsoft-com:office:office" /> Wheels, the Cage is easy to move from job to job. 1 year warranty. FOB Shipping Point. The Select Step Fiberglass Little Giant Ladder is fully adjustable on both sides, so you can use it in multiple heights and configurations. No matter how you set it up, the patent-pending Select Step provides a comfortable standing platform that offers heel-to-toe foot support at the top recommended step. Because both sides telescope independently, you can use the Select Step safely over obstacles, sloping ground, and on stairs or uneven surfaces. Select Step is the only fiberglass stepladder that allows you to safely work on stairs. The Select Step FG is ANSI rated for special duty use (Type IAA - 300 lbs.) 1 year warranty. FOB Shipping Point. 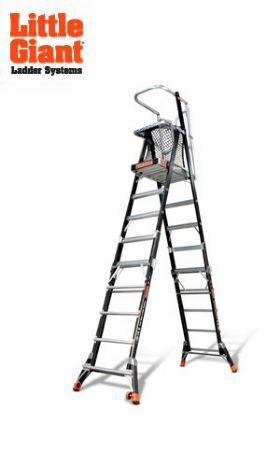 Little Giant Ladder&reg; Multi-Use ladders can be used in dozens of unique configurations, as an A-frame, extension, staircase and 90&deg; ladder, and as a trestle-and-plank scaffolding system. 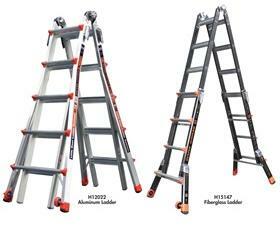 Little Giant&reg; Ladders' wide-flared legs and wide rungs provide an unmatched feeling of safety and stability. Multi-Use ladders are rated to hold 300 lbs. on both sides and are true two-person stepladders. 1 year warranty on fiberglass ladders and lifetime warranty on aluminum ladders. FOB Shipping Point. 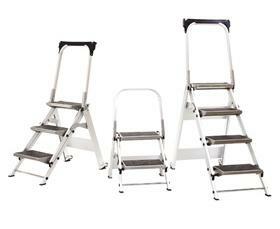 Little Giant Ladder easy-to-use design folds to only 5" for easy storage. Convenient safety bar for additional security. Lightweight, corrosion-resistant aluminum construction and Tip &amp; Glide Wheels for easy transportation. Available in 2, 3, 4 - step models. 1 year warranty. FOB Shipping Point.